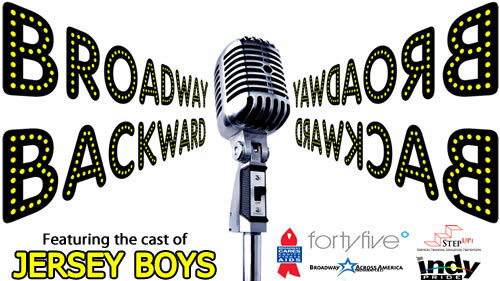 Jersey Boys National Tour Featured in ‘Broadway Backwards’ Benefit in Indianapolis on June 17! The Jersey Boys national tour company will be featured in “Broadway Backwards” on June 17 at 10:30 PM at Forty-Five Degrees in Indianapolis! It will be truly a unique night of Broadway switcheroo, in addition to a silent auction. All proceeds will benefit Step Up, Inc. and Broadway Cares/Equity Fights AIDS. $20 suggested donation at the door. The cast is coming after their show is over, and while we are stating a 10:30pm start time, it may be later than that. Forty-Five Degrees will be hosting the event, which is co-sponsored by Indy Pride, Step Up, and Broadway Cares/Equity Fights AIDS.